Venezuela's military high command is using social media to staunch more defections from the country's air force. At the same time, an exiled dissident predicts more military brass will leave as the crisis over the presidency continues. 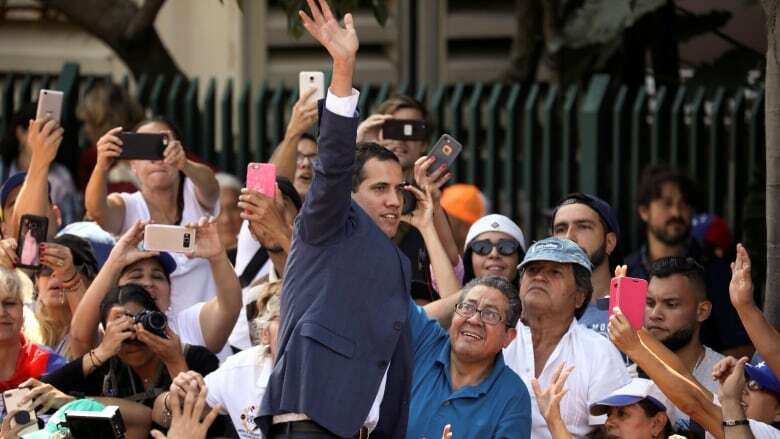 After days of speechifying before enthusiastic crowds, Venezuelan opposition leader Juan Guaido by Saturday night had completely lost his voice, his spokesperson Edward Rodriguez told CBC News. He plans to take two days without public appearances or interviews to recover it. But a deputy in his Popular Will party told CBC he used the last notes of his vocal cords on Saturday to cold-call generals, colonels and admirals of the four branches of Venezuela's armed forces, trying to persuade them personally to follow the example of Air Force Gen. Francisco Yanez, who switched allegiance to Guaido on Friday and called on his fellow officers to do the same. Guaido, leader of Venezuela's National Assembly, has declared himself interim president of the country in an attempt to depose Nicolas Maduro. Canada and the U.S. have recognized Guaido's leadership. Venezuela's opposition leader takes oath as interim president, endorsed by Canada, U.S.
One retired Air Force general did follow Yanez's lead on Saturday. Jorge Oropeza Pernalete put on his old flight suit to call on his comrades to turn their backs on the regime. Oropeza was the top commander of the Air Force under President Hugo Chavez until 2012. Defections also continued in the lower ranks, again with the Air Force leading the way. Air Force Maj. Raynell Martinez Mujica posted her own pro-Guaido video on Saturday in which she echoed Yanez's statement that "90 per cent of the members of the armed forces are against Nicolas Maduro." Just hours later, another Air Force major, Víctor Romero Melendez, followed suit, holding his sabre in one hand. German Ferrer, a one-time Marxist guerrilla who is still a sitting congressman for Maduro's United Socialist Party, although he was stripped of his parliamentary immunity and issued with an arrest order in 2017 after accusing Maduro of electoral fraud, is monitoring the defections. Together with his wife, Luisa Ortega, a Supreme Court justice who also broke with the Maduro government, Ferrer fled Venezuela by motorboat to Aruba and today lives in exile in Bogota, Colombia. "Yanez was speaking the truth when he said that 90 per cent of the military are against Maduro," Ferrer told CBC News. "The high command are loyal because they have grown rich. They have been allowed to profit from narco-trafficking. But the middle ranks are deserting." "They're so worried about the Air Force that they've disabled some of their own combat aircraft. They don't want them to be used against them." CBC News has not been able to independently confirm any deactivation of combat aircraft. Venezuela has a number of aging F-16s, as well as more modern Russian Sukhoi fighter bombers. Combat aircraft have been used in a coup attempt in Venezuela before. When Hugo Chavez tried and failed to depose an elected president in 1992, an F-16 flown by a pilot loyal to the government shot down a rebel OV-10 Bronco in the skies over Caracas. The high command of the military, however, seemed determined to staunch the defections, using the same social media tools as the dissidents. On Saturday, commanders of various units and bases around the country put out tweets pledging loyalty to President Maduro. Most used the slogans "Soldiers always! Traitors never!" or "Loyal always! Traitors never!" and some included videos or photos of soldiers being led by their officers in displays of loyalty. The commander of the 43rd Field Artillery Brigade released a video that showed his unit's firepower, saying his men were ready to defend the fatherland. The video showed Russian self-propelled 152 mm howitzers and Grad missile launchers in action. Maduro has claimed in recent days that the opposition led by Guaido is preparing a coup that would be backed by foreign troops. The Trump administration's national security adviser John Bolton seemed to bolster those claims when he appeared at a briefing carrying a folder that had the words "5,000 troops to Colombia" ostentatiously written on it. But there is no evidence that any such move is actually in the works. An article in Colombia's constitution requires Senate approval before any foreign troops can enter Colombian territory. There have been troop movements by the Colombian Army into the area around Cucuta, the busiest of the border crossings between the two sister nations. But Colombia's president Ivan Duque, a fierce critic of Maduro, has denied any plans for an incursion into Venezuela. On Saturday, he said his government has worked since its first day "so that Venezuelans can have liberty and get out from under that loathsome dictatorship," but he added that "we've always done so without bellicose language." He also said that "few hours remain to the Venezuelan dictatorship" and praised rebel Gen. Yanez for "giving a great example that I'm sure will generate a domino effect in the Venezuelan armed forces." Duque has opposed military intervention in the past and the Colombian ministry of defence has insisted that the comings and goings of U.S. C-17 Globemaster transport aircraft in Bogota in recent days — flagged by amateur plane-spotters — are routine and not connected to the situation in Venezuela. On Saturday night, Maduro announced via Twitter that he had ordered the incorporation of the United Socialist Party's Bolivarian Militia into the country's armed forces. The militias wear beige uniforms over the red T-shirts of the Chavista movement, admirers of the Hugo Chavez brand of socialism. A large number of its members are men and women over 60, typically drawn from the poorest sectors of society that depend heavily on government benefits, and few have any training beyond marching and drilling. Most are equipped with Russian Mosin-Nagant bolt-action rifles of Second World War vintage. The militia's main function is to parade at rallies staged by the government, where they've become increasingly visible in recent months. The move to incorporate them into the armed forces represents the latest step in the 20-year-long politicization of Venezuela's military, and seemed likely to aggravate dissent among career officers already troubled by a calamitous decline in the prestige of an institution that was once held in high regard by Venezuelans. At the same time, the move hardly seemed likely to give pause to Venezuela's neighbours Colombia and Brazil, both of which can call on stronger, better-equipped and more professional forces than Venezuela. Colombia's army in particular has been hardened through years of combat against guerrilla groups such as FARC and ELN, which Colombia says were surreptitiously supported by the Chavez and Maduro governments. On Saturday, Colombian forces scored a major victory against the dissident factions of FARC that have refused to disarm under Colombia's peace process, killing the guerrilla chief known by the alias Rodrigo Cadete. The ex-Chavista congressman Ferrer is skeptical about the Venezuelan armed forces' ability to fight an armed opponent. The higher command, he says, "are going to leave the country. As soon as they see that there's a real, credible threat, they'll fold. Because they know that the armed forces have no operational capacity. The armed forces are totally fractured." In addition to calling top brass personally, Guaido yesterday sought to back the military into a corner where it would have to choose between disobeying Maduro, or making itself even more unpopular with the Venezuelan people than it has already become. He announced that he would open a corridor for humanitarian aid from the Colombian city of Cucuta to Venezuela's Tachira state. The Colombian government immediately announced its intention to open a depot for aid in Cucuta. Maduro has refused to allow such aid to enter the country, saying it would provide cover for a foreign invasion. On Friday his right-hand man Diosdado Cabelllo reiterated that "Venezuela doesn't accept handouts." But ordinary Venezuelans, particularly the poor, are desperate for relief. Guaido told a crowd in the Venezuelan city of Las Mercedes that the military will shoulder the blame if it stands in the way. "We've spoken to the armed forces. In the next few days we will be assembling an aid convoy, soldiers of this country, of what is needed, because between 200,000 and 350,000 Venezuelans are at risk of death from malnutrition, lack of medicine, dialysis, insulin and cancer drugs." "You, soldier, will have in your hands the possibility of allowing that aid into the country." Venezuela: Is there hope for my 'country of the absurd'?